We have previously looked at the Albert St Uniting Church. The parish itself is one of the oldest in Brisbane, having kicked off in 1849 as the Albert St Wesleyan Church, situated then on Albert St between Adelaide St and Burnett Lane. The initial small church hall only seated 150 people, so it was rebuilt on the same site in 1855, this time facing Adelaide St instead of Albert St. Here is a photograph of that building from around 1883. This second church was much larger than the original, having room for 500 worshippers. It had large Gothic windows at each end, together with further windows down each side. 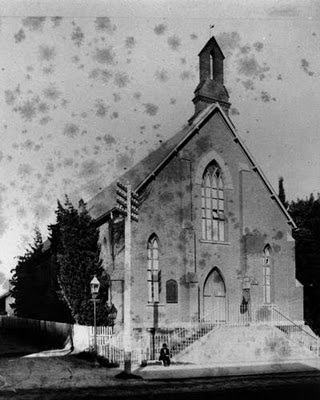 The church was opened in December 1856, and was sold when the church moved to the current building on the corner of Albert and Ann Sts some thirty years later. 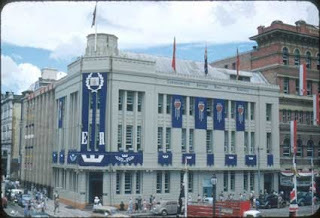 The Albert St/Burnett Lane site was later to become the home of a branch of the Commonwealth Bank, shown below in 1954 when it was kitted out for the royal visit. There was a building on this site between the church and the bank decked out for the royals. It had a small tower/dome on the corner. TFF, from looking at other old photos, I'm pretty sure the second church building from the 1850s (built by Joshua Jeays) was actually on the corner of Burnett Lane and Albert Street, with the church (grave?) yard on the corner of Albert and Adelaide. The photographs certainly seem to support what you say. I'll see what other information I can find.